Our highly skilled mechanics can supply and fit any engine. We are sure ours is a service you will find hard to beat! 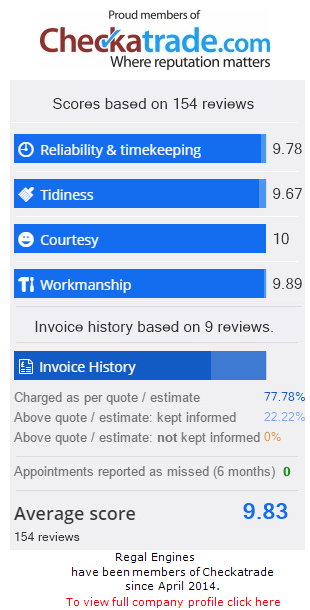 With our excellent reputation for honesty, reliability and good workmanship, we are sure ours is a service you will find hard to beat! We perform a complete test against manufacturer approved values and will give you the report our equipment provides as proof of any problems. Our excellent reputation for honesty, reliability and good workmanship is very important to us. Add to this our highly skilled mechanics who can supply and fit any engine, our competitive labour rates, a 12 month or 12,000 mile guarantee, and we are sure ours is a service you will find hard to beat! We can now perform a complete test on all Diesel Injection Engines to the public and trade. Our engine reconditioning workshop is fully equipped with the latest technology, and unlike many other companies we welcome you to visit our premises at any time to view the work in progress on your vehicle. At Regal Engines, we take great pride in our work and will always be happy to see you. In the unlikely event that your engine should become defective due to faulty materials or workmanship within 12,000 miles or 12 months from the date of purchase, we guarantee to replace either the unit or all defective parts free of charge at our discretion.